Dealing with four demanding clients, Megan Waters thought her job as a wedding planner would involve romance and eternal bliss. Instead her profession has been causing drama, outrageousness, and has made Megan reach for the aspirin bottle in her top drawer more than once. In Carli Palmer’s debut novel, the term Bridezilla lives up to its moniker. Follow the crazy journey in one determined woman’s life, where what should be a time to celebrate, ends up being her worst nightmare! First things first, tell us about Down the Aisle with Bridezilla. Such an interesting title! Thanks! This book is about a wedding planner named Megan Waters who resides in Malibu. Along with a friend from college she forms a wedding planning company catering to rich clients- aka the bridezilla. The story is about how she keeps her head straight while pleasing to all their demands. And their demands are outlandishly ridiculous! I don’t consider Megan Waters special. I wanted her to be relatable to readers. To me that meant making her as ordinary as possible. With the same goals as other gals – love, some good luck, and a good life. How did the idea come about for this storyline? For this book I got the idea from a TV show called Bridezillas which doesn’t run anymore. I remember thinking that I never read a novel from the wedding planner’s point of view. It’s always about the bride. By seeing the story unfold through Megan’s (the wedding planner) eyes we see how crazy these brides really get. How much research did you do for this novel? Better put, is there anyone you based this novel on, names withheld, of course. Tons. This book was my first true attempt at a full-fledged novel so I figured it would be more believable if I had an idea of what the wedding business was about. My research was solely the Internet and personal experience. I scoured tons of sites to find out what the going trend was, then I blew it out of proportion to fit the book. My brides are anything but plain and ordinary. But it’s not based on anyone I know, that’s where my imagination came in. What does your writing process involve; any steps you like to take specifically? It’s really all over the place. Sometimes I’ll do my research first, other times I might just dive into the writing. It varies on what my mood is. If I have a scene in my head that I don’t want to lose track of I’ll write it out right there and then and then go back to fill in the facts and details. I still do write the first draft with pen and paper. Then I type it out. It’s what I grew up with and helps me think out the story more. Plus there is something soothing to me to actually writing it down first. I am definitely a planner. I start with the initial idea. Then I work on the characters, locations, and then a book outline and last but not least I outline each chapter. I love working with pictures. So tons of magazine photos end up in my files after the book is done. If I’m describing a dress or a bouquet, chances are I have a picture somewhere that sparked the initial concept. If/when you get hit with that inevitable writer’s block, how do you overcome it? Ugh!! I consider it losing my mojo. It’s like an ocean wave for me. When the wave comes in, I write like crazy because I am in the zone. When the wave is out, my thoughts don’t connect and I hate everything I’m writing. To get out of it I’ll usually jump to another project I’m working on. Right now I’m working on my second book due out next year hopefully and an idea I have for two book series and also a screenplay. So there’s a lot to keep me busy. Putting together that first book is a long process for most that involves so much. 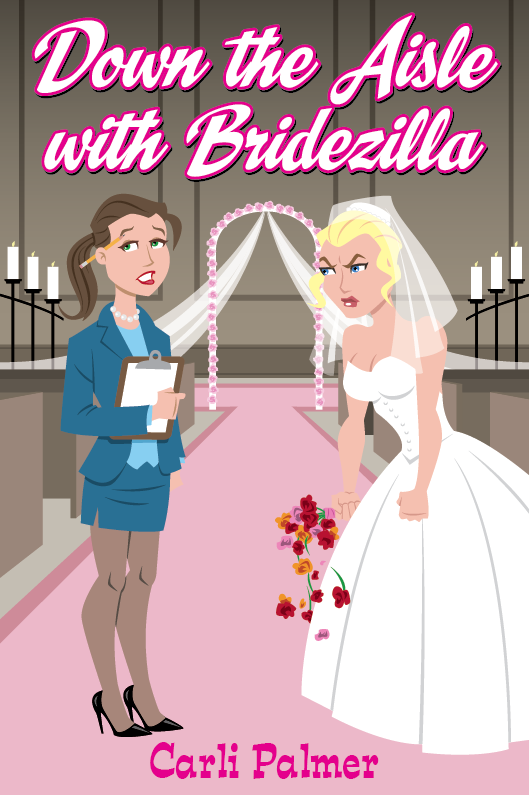 How long did it take you to write Bridezilla? It was on and off for seven years. In that time I was finishing up college and working full time so all my writing was done in my free time. If I had nothing to do besides writing, then I’m thinking I could have had it done within a year. The ending. At first I didn’t know how to end it. I wanted Megan’s story to go on and on. I get that way about TV shows too – thinking why did the network have to end that series? Life goes on I guess. Was there any particular areas of your manuscript you found the most difficult to write? Grammar always is an issue for me. I was never an English major, just a sociology major so that’s why I have an editor. LOL. Self-publishing allows the no-name writer like me to tell a story. I’ve read books from authors who wouldn’t have gotten the time of day from a publishing house. And they were fantastic books. A big disadvantage of self-publishing that I’m just finding out is the marketing. You have to do it all yourself and it’s a learning road with a lot of roots sticking out of the ground. Choosing names for our characters can be easy or tough, based on the personalities we create. How relevant are the names of the characters in your books? I definitely think about the name for a while. I really do think it makes a difference. Think about it – would we think of Scarlett O’Hara in the same way if she was called Jane? Megan was a down to earth name pertaining to the fact that I wanted her to be ordinary so I couldn’t name her something like Jasmine or Cleo – or anything with finesse to it. I actually have a few lists of names that are about 30 pages long – for male, female, and last names. I go through them when I’m creating a new character and whatever hits me, I pick. Is there a famous person, living or dead, who inspires you? Too many to count. If I had to pick right this moment I would say it’s a three way tie right now between Kate White (author), Cleo Coyle (author), and Stephen J. Cannell (writer/producer). Kate White writes a mystery series that I have read over and over about twelve times. Cleo Coyle also writes a mystery series that takes place in a coffeehouse. Both are still alive. Stephen J. Cannell created over 40 TV shows including 21 Jump Street, The A-Team, and Baretta. He passed away in 2010. If you ever watched his shows, he was the guy in the end sitting at a typewriter and throwing a sheet of paper into the air. If you were given the opportunity to spend some time with him or her, just what kind of day would you plan? I would sit with them at an all day writing session. Coffee, food, talking, and coming up with a great crime drama/suspense mystery. Kate would supply the suspense, Cleo would supply the details, Stephen would supply the drama, and I would supply the characters. All this taking place on a balcony overlooking Los Angeles somewhere where we could listen to the sounds of the streets. It’s always fun to visualize our books on the big screen. If you could cast your characters in the Hollywood adaption of your book, who would play your characters? I could see Megan Waters as an unknown actress and the brides all being established actresses. For some reason I can see Cameron Diaz playing a bride. She can do a nasty side pretty well. Time to humbly advertise. Are there any social network or websites where readers can learn more?